Kingdoms at War • View topic - Introducing Showcase and Trade Filters and Sorting! Introducing Showcase and Trade Filters and Sorting! This is a neat little feature that a lot of players have asked for, so we are happy to oblige! You can now use three sorting methods (Power, Recent, and Name) in your Showcase and Trading menu to easily find your items. To use it you just have to tap the sort button and that will allow you to switch between them. 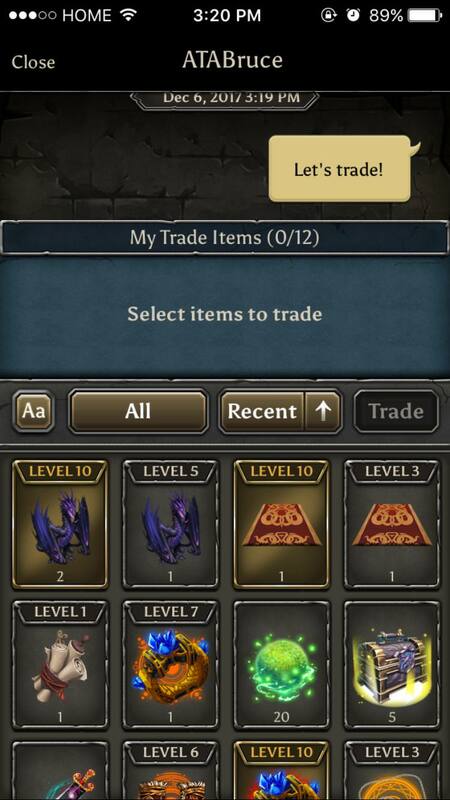 You can also tap at the arrow symbol to choose between ascending or descending sorting order. You can also now use filters and sorting to choose what Showcase items you would like other players to see on your Profile page. Your Showcase will remember the filter/sorting option you chose so you can, for example, display your Charms in ascending order according to their Power (Combined Stats). 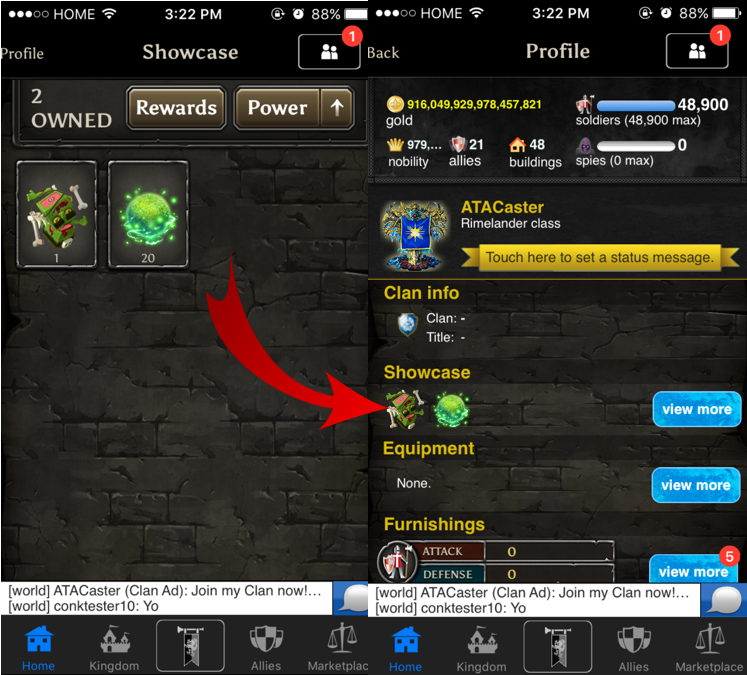 Note that other players are still free to use the filter and sort options to see all of your Showcase items. Please note that this update requires the latest version of KaW and is released on ANDROID DEVICES ONLY for the time being. It will release on iDevices as soon as it is approved by Apple. Re: Introducing Showcase and Trade Filters and Sorting! Would be cooler if they workes though. xXD3mOnXx wrote: Would be cooler if they workes though. I'm pretty sure by not working he means that charms have no impact on the player. There is another thread in active topics claiming that charms don't do anything. ATABruce wrote: Didn't realize this was actually picking up steam. Charms work in exactly the same way that your equipped BFE works. Of course, because the stats provided by an individual Charm is (generally) a fraction of the Equip it came from, you need quite a few more to meaningfully increase your chance of success. There's no conspiracy here. Responded with this in the other thread. You can discuss more there if you like. I can dig it. Nice feature. Also, can someone tell me how to enchant furnishings? I select a furnishing, hold down until the specific item detail box appears where 'dismantle / equip / max' is listed. I've dismantled a couple items so I have the materials, but have not been able to figure out how to upgrade a furnishing beyond level 1. This vexes me. Radagast wrote: I can dig it. Nice feature. The goal of the featured items section is to make your life easier by displaying the Marketplace items that people most often purchase, including key event items. It's intended to save you the scrolling, but if you're finding it's not doing its job you can give Charlie your feedback. He has full control over what shows up there. Regarding Furnishings, if you are seeing "Dismantle / Equip / Max" it means that the particular item you are looking at cannot be upgraded further. Some slots like walls, floors, and the banner are not upgradeable. This isn't true. The total bonus gained from charms just isnt what it claims to be on your profile, whereas Equipment and BFA give you exactly what it states. ATABruce wrote: Regarding Furnishings, if you are seeing "Dismantle / Equip / Max" it means that the particular item you are looking at cannot be upgraded further. Some slots like walls, floors, and the banner are not upgradeable.